WAGNER: WERK Museum Postsparkasse, Vienna: Vienna is the fourth European stop for the exhibition “Second life. Upcycling glass design from Finland” with selection of works by two Finnish designers Jan Torstensson and Jukka Isotalo, currently shown at the extended exhibiting hall of he WAGNER: WERK Museum Postsparkasse. In a busy atmosphere of a typical savings bank with clients constantly walking in and out, the large room of the Otto Wagner architectural masterpiece hosts an intelligently curated exhibition which concentrates on two different approaches to glass upcycling. remarked with a touch of sincere excitement Rolf Sachsee, professor of design history and theory at the HBKsaar in Saarbrücken and one of the “Second life” catalogue editors. We didn’t want to state the obvious. The nice thing about this word game is not just that the bottles have a chance of a second life through the upcycling process,but that the art-pieces are “moved” from the world of design into the real world, becoming more palpable. They had to fight hard to shake off the cult status of their legendary predecessors who took the designer world by storm after a huge success at the 9th Triennial in Milano in 1951. Many generations of designers were paralysed by fear of failure which came from enormous expectations the world imposed on them. 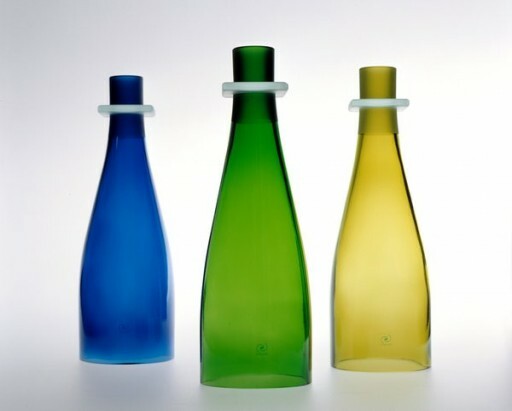 Tapio Wirkkala, Timo Sarpaneva, Kaj Franck, Sarah Hopea, Helena Tynell and Nanny Still, who become internationally acknowledged over night, have reigned over the Finnish design scene until the end of 1960’s, when the commercial production of glass in the country took over. Recent development in Finland shows that the artists made a step back from the commercial, big glass factories in favour of their own small business in studios where they produce original design pieces, often in small batches. They deliberately do not want to be involved in the mass production. Although Jukka Isotalo and Jan Torstensson have chosen different manufacturing techniques, they both have something in common – the choice of recycled glass as their favourite material. While Torstensson leans on the classical glassblowing tradition, warming-up or melting recycled glass, Isotalo relies on so-called cold techniques involving cutters, grinders, bevelling machines and abrasive stones. Mechanical engineer by profession, Torstensson has found his new passion for design after visiting the Glass museum in Riihimäki where he discovered his own family’s long glass-making tradition. Upon finishing specialized courses in classical glassblowing, he has set up his studio (2003/2004) in a former cow barn, first planning and than building his own technical equipment. After a year of experimenting, Torstensson has designed and developed devices that were suitable for the production of glass items through the upcycling process, in small series. 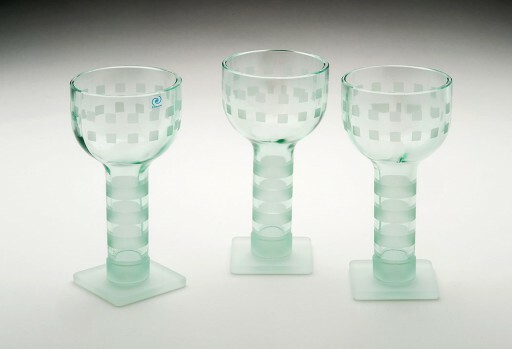 His first successful production line – drinking glasses “Hik” – created in 2005 for the Helsinki-Vantaa Airport – was awarded in the same year at the handicraft fair in Tampere. Due to high demand for his products, Torstensson expanded the studio, adding new ecologically-friendly machines and kilns for warming-up and melting of recycled glass. He is etching glass by sandblasting, forming discrete decorative patterns. Jukka Isotalo studied design at the University of Art and Design in Helsinki, but the decision to spend a year at the Konstfack University College of Arts, Craft and Design in Stockholm as an exchange student, was going to influence his later choices: the remnants of a wild booze party left in the school’s storage room made him wonder what one could possibly do with so many bottles. Having just learned how to cut, abrade and polish glass, he came to an idea for his first product – a cylinder-shaped vase which proved to be a best-seller at a local Christmas bazaar in Stockholm. Upon returning to Finland, Isotalo initially continued his work with recycled glass in a studio at the University of Art and Design in Helsinki. His glasses sold so well that he had to, due to constantly growing production, delay his studies. In his final year at the university towards the end of 1996, Jukka Isotalo had a first solo exhibition in Stockholm, during which his artistic glass objects also were sold. Two years later, he founded his own company Evolum AG. 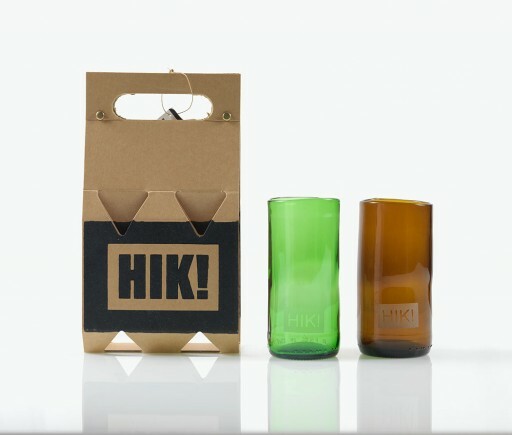 Since then, a variety of items, all made from recycled glass – mainly from empty wine & spirits bottles which the company is supplied with by Helsinki’s best restaurants – has been produced. My working process is so to say very straight-forward. I make markings with pen, I cut and polish glass and finally, I usually add a personal touch by sandblasting it without acid polishing, after having applied stencils on the clean surface. For all the items exhibited here in Vienna, I used recycled bottles of diverse origin and shapes. There are Calvados/ schnapps/ vodka/ wine/ mineral water bottles from Scandinavia, Italy, France, Greece and some of them are combined into one art-piece. Isotalo’s works were commissioned by the city of Helsinki and the Finnish Ministry of the Environment, as well by large companies, banks and international brands such as Rolls Royce. 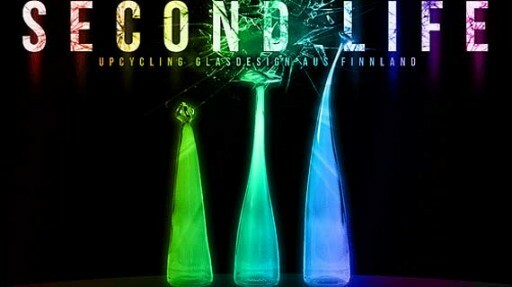 He was declared artisan of the year in 2003 and in 2009, he designed the winners trophies for the World Cup slalom in Levi, Northern Finland, from used wine bottles. I love to work with timber. For all my wood design items, I cooperate with a great carpenter, one of the best in Finland whose works is of top quality. One of the reasons why I generally prefer working with organic materials is that they are environment-friendly which can’t be claimed for, let’s say, metal. Mo-Fr 10 a.m. to 5 p.m.